August is halfway over, but there is still plenty to celebrate. This week, and the third week of every August, is Friendship Week. It’s time to honor those special people in our lives who support and listen whenever we need them. Take the time to hang out with them, call them, or send them a gift so they know how much their friendship means to you. Also, this week is Senior Citizen’s Day on August 21st. This is the time to remember the older people in your life. Often, they are lonely so it’s good to spend time with them or send them a gift to brighten their day. Finally, August 25th is Kiss and Make Up Day. Perhaps you haven’t spoken to a friend or family member in a while because of a dispute. Today is the day to clear up that conflict and strengthen those bonds. 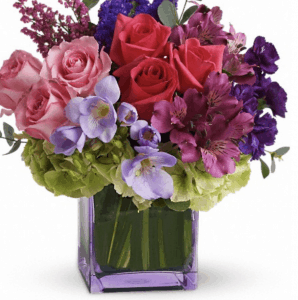 This beautiful bouquet contains a mix of premium flowers in a lavender vase. This bouquet offers pink, the color of affection, and yellow, the color of friendship, perfectly combined. Seasonal blooms are arranged together in a couture vase. This bouquet offers a bright, tropical arrangement with bold colors in a vase along with a 20-piece Hedonist truffle package. It’s a great gift for anyone! 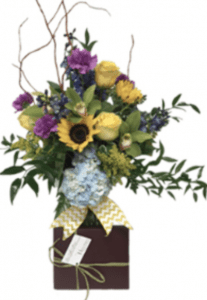 This stunning arrangement is sure to bring a smile to your special someone’s face. It’s a garden style floral design that brings together a mix of colors, flowers, and greenery in a large flower arrangement. 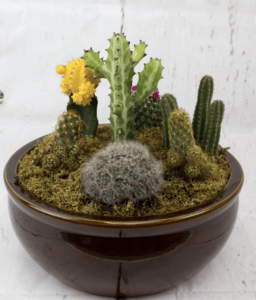 This 14-inch ceramic planter is available in many colors and offers green and flowering plants that are arranged together into a great indoor garden to enjoy. Even easier to maintain is this garden of different succulent plants as well as a colorful blooming plant. It fits on a table or desk. This is a great gift for a friend to cheer them up. The gift package offers one Dammit Doll and a 10-piece assortment of Hedonist chocolate. Friends or family members are sure to enjoy this generous gift basket full of seasonal fruit as well as savory and sweet treats. Fruit only gift baskets are made with fresh seasonal fruit and presented in a natural gift basket. Order your special gifts today!